A painter and decorator has been found guilty of providing his car to the UDA which was used in the murder of loyalist rival John ‘Bonzer’ Boreland. Thomas Boyd Pearson, 63, formerly of Cliftondene Park in north Belfast, but now with an address at Rathglynn in Antrim, had denied a single charge at his non-jury Belfast Crown Court trial of making property available to terrorists, namely a silver Renault Megane car. He had pleaded guilty to a charge of perverting the course of justice by burning the Megane after the murder. Two men – Darren McAllister and Thomas O’Hara – have already pleaded guilty to perverting the course of justice over the vehicle. 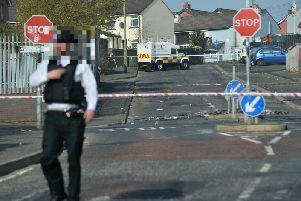 It was the prosecution case that the silver Megane car was seen by witnesses leaving the murder scene at Sunningdale Gardens, north Belfast, after a number of shots rang out. Mr Boreland was found slumped between two cars on the evening of Sunday, August 7, 2016. A post-mortem examination said he had died from “significant head trauma’’ caused by a shotgun wound to the head. Pearson later told police that in fact a car load of people had come his door and described them as “sinister”. “At this stage of the interview,’’ said the Belfast Recorder, “he was confirming his belief that they were members of a group, which is either a terrorist group or a proscribed group and regarded members of that group he came into contact with as ‘sinister’. Pearson denied to police that the request for his car had come from north Belfast UDA, but said the request could have come from another area. The Belfast Recorder concluded: “I am satisfied ... that at the time he made the vehicle available he knew that it was going to be used for the benefit of a proscribed organiation ... his replies indicate his knowledge that it was the Ulster Defence Association. Judge McFarland released Pearson on continuing bail to be sentenced with his two co-accused next month.